In Winter I (re)discovered my love for soups. I have to admit that was never the biggest fan of soups. Not as a starter and certainly not as a full-featured main course – for me it was lacking the texture and bite… well, and I was lacking the appreciation for this amazing dish. 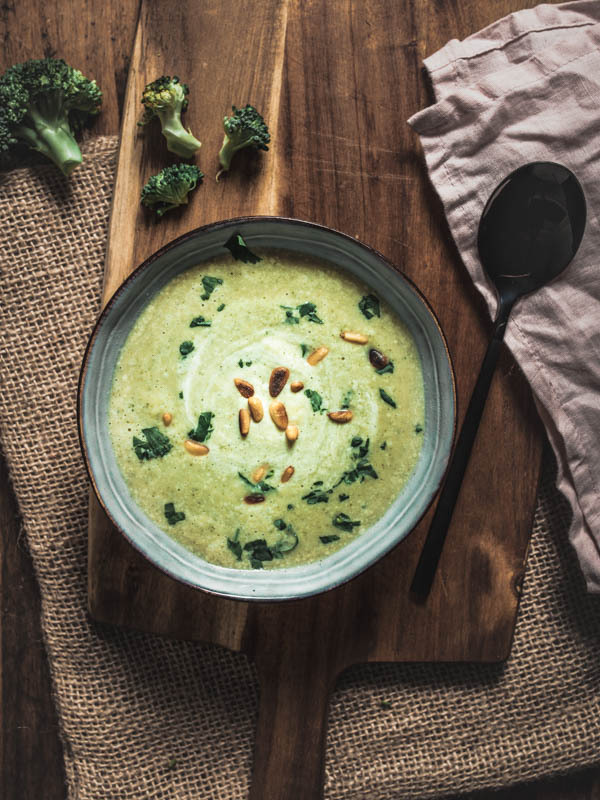 But during the past cold months I was seriously getting into the soup mode and tried a new, warming, creamy, homemade soup almost every other week. 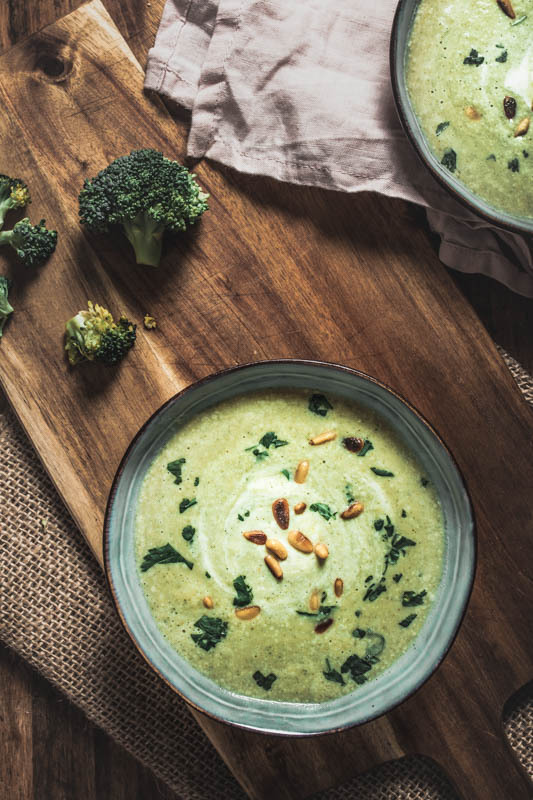 Today I’ve got our favourite cream of broccoli soup with hummus for you. Broccoli is truly one of the best veggies and I should have been uploading way more broccoli recipes onto this blog. 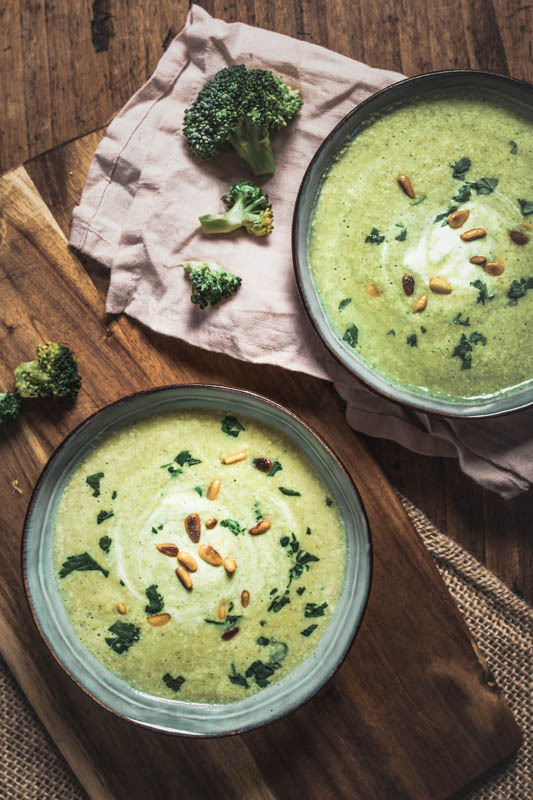 But let’s start with all modesty and make this classic, creamy soup. 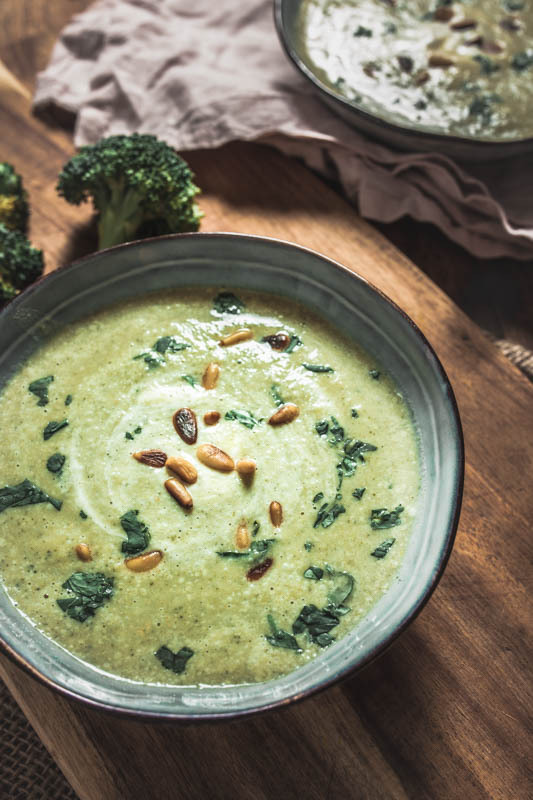 This cream of broccoli soup is not only super smooth in taste but also, without much effort, vegan. The broccoli then was accompanied by onions, garlic, (plant based) cream and a dab of hummus. 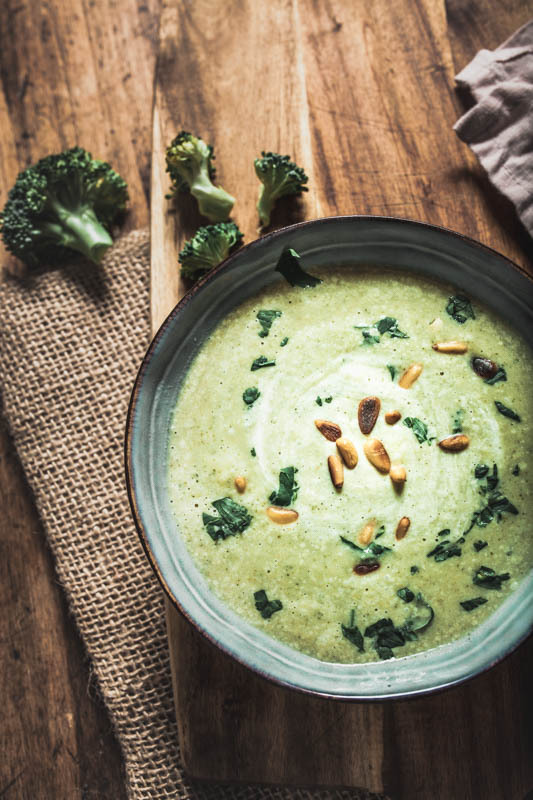 Interesting what happens when you want to get rid of stuff in your fridge :D. The hummus – kind of the secret weapon of all vegans, is a great addition to the cream of broccoli soup. You can either make the hummus yourself, but a store bought one is fine as well. The second time I left out the goat cheese and added an extra blob of crème fraîche (in Germany we have a vegan ‘Creme Vega’ from Dr. Oetker for example, check out what your country has in store) and topped the soups with roasted pine seeds and fresh parsley (I definitely have to get better with the creamy swirl for my next soup shooting ^^). Peel and chop the garlic and onions roughly. Add them to a pot with some oil in it and sauté them on medium heat. Add the broccoli and roast it for a couple of minutes. Deglaze with vegetable broth and let it boil for about 5 minutes. The heat can now be turned down. To blend the broccoli smoothly use a hand-held blender until no clumps are left. Add the cream, hummus and optional crème fraîche or soft goat cheese and season to taste with salt and nutmeg. If you like you can roast some pine seeds and chop some fresh parsley as a garnish. Welcome to my soup kitchen! We made this recipe for ourself and our parents. We all really liked it, the hummus was a nice touch.